It’s one of the oldest cooking methods in the world… somewhat tribal, actually. Dig a hole in the ground (a pit), light a fire, add some meat (usually a large mammal), cover it and let it cook. 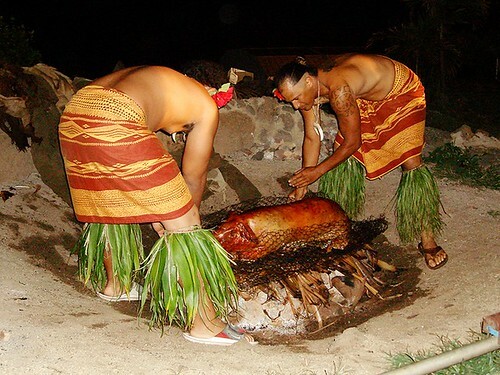 As island traditions go, this is commonly known as Kalua Pig. There are other variations as well including Cuban, American and Africa traditions. Despite the variations, they all follow the same basics (below) and can be used for a variety of meats from the traditional pig to turkey or even fish. You can add fruits and vegetables as well. Dig a hole. Big or small… it all depends what you are going to cook. Just dig about a foot bigger than you need in each direction for air flow. Go about three feet deep. Line the pit if you can with stones or bricks. This helps hold and control heat better, but you only want to do this if you want to keep and reuse the pit. If you plan to fill it in when you’re done… then don’t worry about it. Fill the bottom 1 foot of your pit with coals and/or wood. Start the fire and let it burn down until the coals and wood are glowing and the flame is minimal or totally out. Flavor and wrap your meat. Wrapping the Meat: Whatever it is you choose to cook needs to first be flavored and then wrapped. The Cuban and American methods use chicken wire to tightly wrap the meat. A more modern method is to wrap in damp burlap bags and then wrap in tin foil. The more traditional, Polynesian method is to use banana leaves. I suggest you use banana leaves if you can. For larger animals, you may still want to use the chicken wire to keep things together and make it easier to handle without falling apart. Lower your meat and anything else you are cooking (veggies and fruits can be wrapped in leaves or foil as well or simply loaded into pots). Then cover the pit. Covering is important for temperature control as well as keeping in moisture so things don’t burn up. Once you do this, the coals will actually remain hit for days. Cover your pit with wet burlap or banana leaves. Cooking time will be a least 12 hours, but could longer depending on what you are cooking. Since the food is wrapped tight, it will not dry put and will not overcook.